The Constitution states that the national symbols of Ukraine shall be the National Flag, the National Emblem and the National Anthem. The Ukrainian flag consists of two horizontal stripes of equal width. The top is blue, the bottom - yellow. Blue and yellow, the colors of the sky, mountains, streams, and golden fields have symbolized Kyivan Rus' long before the introduction of Christianity. With the acceptance of Christianity, blue and gold were incorporated into church symbolism. After the Mongol-Tatar invasion in the 1200's the use of blue/gold was interrupted, to be revived again in church ornaments and city crests some time later. The emblem of the city of Myrhorod, for example, was a gold trident over a blue background. Another city, Pryluky, used the head of an ox in gold over a blue background as its insignia. And in Lubny, the city emblem pictured a hand holding a golden mace over a blue background. The banners of the Cossacks (17th Century) were blue with gold stars, a gold cross, or with pictures of saints rendered in gold. 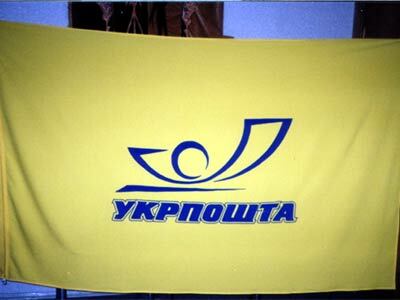 The blue and yellow flag as the national flag of Ukraine by the Supreme Rada in 1992. The blue-yellow flag was firstly displayed in Lviv (Lvov, Lemberg) in 1848. Orenburg, for example, have blue-yellow CoA too, But it is not in Ukraine. Banners of Cossacks were different: blue, red, dark-red, green and other. In Sweden there is a story going around, stating that the blue and yellow of Ukraine come from the blue and yellow of Sweden. When King Carl XII of Sweden (he was king 1697-1718) went to war against Peter the Great of Russia, he made allies with the Ukranians, who wanted sovereignity from Russia. The Ukrainians should therefore have taken up the colours of Sweden as their colours. However, I don't know if there is any truth in this story. The state symbols of Ukraine are the State Flag of Ukraine, the State Emblem of Ukraine and the State Anthem of Ukraine. The State Flag of Ukraine is a banner made from two equal horizontal blue and yellow fields. The Great State Emblem of Ukraine shall be determined in accordance with the Small State Emblem of Ukraine and the Emblem of the Zaporiz'ke Viys'ko (Zaporizhzhya Cossacks Army) by law, which shall be adopted by no less than two-thirds of the Constitutional membership of the Verkhovna Rada of Ukraine. The main element of the Great Emblem of Ukraine is the Sign of the State of Prince Volodymyr the Great (the Small State Emblem of Ukraine). The State Anthem of Ukraine is the national anthem with the music of M.Verbytskiy and words, confirmed by law, which shall be adopted by no less than two-thirds of the constitutional membership of the Verkhovna Rada of Ukraine. The description of the state symbols of Ukraine and the order of their use is determined by law, adopted by no less than two-thirds of the constitutional membership of the Verkhovna Rada of Ukraine. The capital of Ukraine is City of Kyiv." Ukraine declared independence from the USSR on 24 August 1991. MPs celebrated the event by carrying a huge light blue and yellow flag through the assembly hall of the Parliament [Ukrainian Weekly, 1996]. Ukrainians approved the independence proclamation in a referendum held 1 December 1991. Provisional legislation [W. Smith, 1992] concerning the flag was adopted on 4 September 1991, with opposition from the Communists. This legislation therefore also made the Soviet era flag official, and the two flags were hoisted side by side (even on the same flag pole). The light blue over yellow flag was in proportions 1:2. The situation was changed 21 January 1992, when the light blue and yellow flag became the only flag of Ukraine. The proportions of the flag were then set to 2:3. The trident arms were adopted on 19 February 1992 [W. Smith, 1992]. Ukrainian Weekly, 1996: 18th August, (Vol. LXIV, No. 33). Flag Bulletin, 1992: No 149 incorrectly states that the convention took place in 1844.